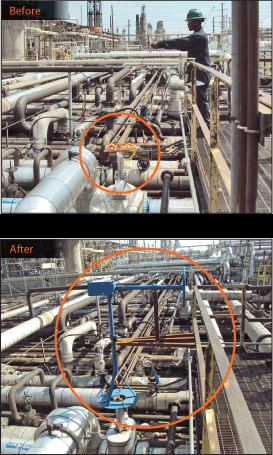 In the refinery pictured (right), access to a valve was impossible from the catwalk. Relocating the valve was impossible, and creating a new catwalk was cost prohibitive. Our customer opted to call Roto Hammer. He immediately spoke to one of our Custom Solution Specialists, who was able to walk the customer through several options. Our final solution was to engineer an extension control with gear box and hand wheel to bridge the distance between the valve and the catwalk. As you can see from the “before” and “after” pictures, the valve is now easily accessible to an operator standing on the catwalk. While this solution was entirely customized to the customer’s unique situation, the entire set up was built using off-the-shelf parts.The finished product was shipped out to the customer within 72 hours of the order date, at a total cost of less than $2500.